Through a happy set of circumstances, all the ingredients for a top meal came together the other day. First, Megan made another batch of meringues for the Jamberoo Community Growers meeting on Sunday. This uses egg whites, and she uses duck eggs when we have them – it makes the meringues hold their shape better, without cracking and collapsing. Duck egg whites are especially good for pavlovas too! So I had a bunch of duck egg yolks. Then at the JCG meeting, our friend Cathy brought along a heap of basil for the swap table. We’re “between harvests” of basil at the moment, so that was very fortuitous. The pasta is dead simple to make. I use a recipe I saw on a Jamie Oliver show – it’s just one whole egg and 100g of “type 00” flour per person. Type 00 is a finely-ground flour especially for pasta making. When I have leftover yolks, I use three of them instead of one whole egg. It makes for a richer, creamier pasta with a lovely golden colour to it. You just mix the egg and flour together until you get a ball of dough. Knead it a bit until it’s silky and a bit stretchy, then wrap it in plastic wrap and sit it in the fridge for an hour to rest. Then take it out, knead it a little more, and start passing it through a pasta machine. 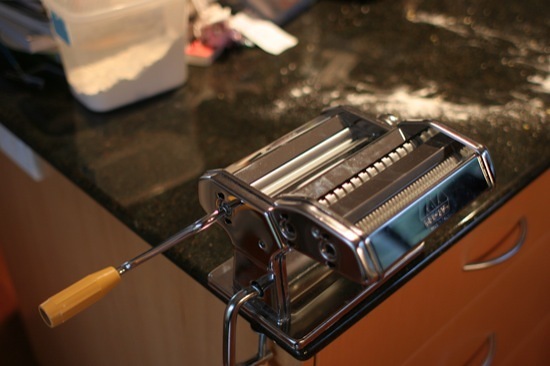 Mine is a simple manually-cranked pasta machine. It works great. Break the dough into small batches (I would break a 2-egg/200g dough mix into 4 pieces), flour it up so it’s not sticky, and pass it through on the widest roller setting a few times. Then pass the dough through once at each thickness, dialling it down to about the 2nd or 3rd last setting. I find it doesn’t come out very well if you go all the way to the thinnest setting. Keep flouring to keep the dough manageable. Finally, pass the sheet of dough through the spaghetti/fettucine cutter. If your machine doesn’t have one of these, just flour up the sheet of dough, roll it up lengthwise, and cut it into thin sections so it unrolls into fettucine strips. I find it helps to toss the pasta in more flour at this stage so it doesn’t stick together while it waits for you to roll the other batches out. Pesto sauce is also dead easy. Before you start, though, put a big pot of salted water on the stove to boil. You’ll need this to cook the pasta shortly. Throw a heap of basil into a blender with some olive oil, garlic cloves and pine nuts, and whizz away. You can substitute parsley or other green leafy herbs for basil, and things like macadamias, bunyas, pecans, walnuts, cashews, etc for pine nuts. Just go with what you have! Then throw in some grated parmesan cheese (proper stuff, not the stuff that comes in a yellow can!). 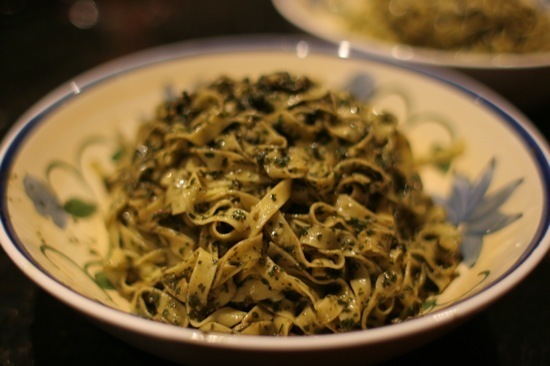 If you want the pesto to taste and look really special, chop it by hand instead of blending it. Or smash it in a mortar and pestle. It’ll look a bit more rustic, with a nicer texture, and there will be more definition between the ingredients. It’s worth a go if you have the time. By now the water should be boiling. Drop the pasta in, and boil it for about a minute or so. It really doesn’t need long. It helps to have lots of water, so it stays hot when the pasta goes in. Drain the pasta, put it in a big serving bowl, and stir the pesto through it. Serve with a bit more shaved or grated parmesan on top, and maybe even some more pine nuts for decoration. 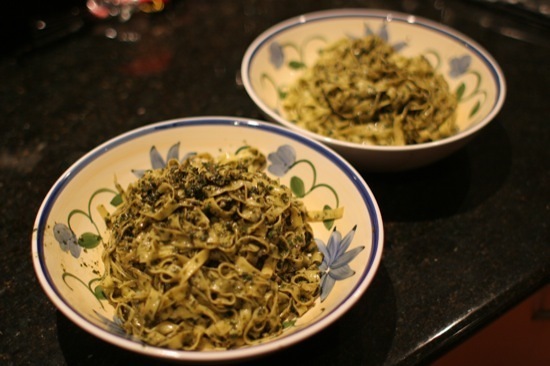 I love making both fresh pasta and pesto. There is nothing quite like the real deal to get your tastebuds tingling! Great work. @Gavin: There are a lot of recipes like these that are quick and easy – it’s definitely a better option than takeaway food! Out of interest, do you use the same method for the pasta? I’ve spoken with lots of people that do it all different ways, but I’ve just stuck with what works for me.